The Kamchatka Peninsula is a 1,250 km finger of land which lies between the Sea of Okhotsk and the Pacific Ocean. About 30% of the land area is protected in national reserves. The most significant feature of the landscape is around 160 volcanoes, of which 29 are still active. This dramatic landscape makes the area one of the most popular for Russian cruises. 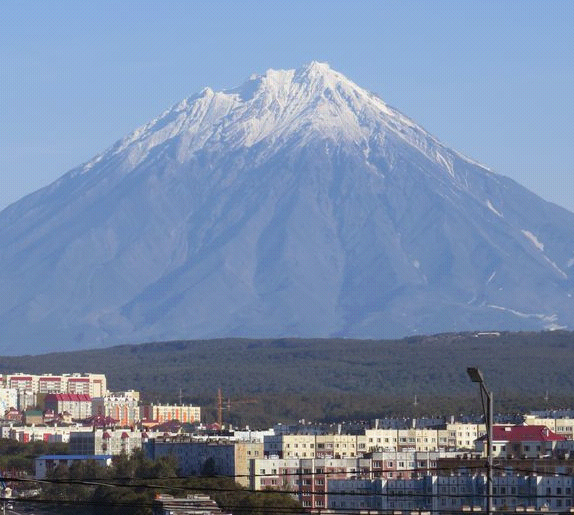 More than half of the population of Kamchatka lives alongside Avacha Bay in the city of Petropavlovsk-Kamchatskiy (often referred to as 'PK') and in the neighbouring town of Yelizovo. Kamchatka Krai consists of the lower Kamchatka Oblast and the Koryak Autonomous Okrug. The Kamchatka Oblast and the Koryak Autonomous Okrug merged in July 2007 to form the Kamchatka Krai. The Kamchatka Oblast makes up the southern portion of the Kamchatka Peninsula. Kamchatka also includes the Komandorskie (Commander) Islands within its administrative territory. The influence of the Pacific Ocean and the Sea of Okhotsk makes Kamchatka’s climate milder than continental parts of the Russian Far East. In general, winters are long with heavy snows, and summers are short, cool and rainy. Heavy fog and sudden changes in atmospheric pressure are common. Join us as we cruise the Kamchatka coast to see some of the famous Kamchatka wildlife such as Kamchatka Brown Bears and Sea Otters. To see the magnificent Steller's Sea Eagles in the wild is an experience never forgotten. Those interested in waterfowl species will be keen to experience the Kamchatka wetlands where at least 13 species breed and many others visit. Of course you will need to visit the Kamchatka region for the best chance to see the Spoon-billed Sandpiper, one of the world's critically endangered species which clings to life here. Siberia's eastern coastline teems with wildlife including brown bears, walrus, a range of birdlife including the critically endangered Spoon-billed Sandpiper and the majestic Steller's Sea Eagle. Spectacular volcanoes, fjords and rolling tundra dominate the coastline. The Kamchatka Coast's isolation has protected its wilderness and wildlife. See fat Kamchatka Brown Bears dozing in the late summer sunshine as the onset of autumn paints vibrant colours on the spectacular coastline. Options to start in Nome, Alaska. The Peninsula stretches from North to South for about 1500kms. The region is mostly mountainous. Koryakskoye Plateau is situated in the northern part of it, almost parallel to each other there are two mountain ranges, Sredinnny and Vostochny extending along the whole Peninsula. The Central Kamchatka lowland is between them. Kamchatka is known as the “land of fire and ice” for its countless boiling mud cauldrons, steam vents, fumaroles and other forms of volcanic activity including 414 glaciers and 160 volcanoes, 29 of which are still active. The coasts of Kamchatka are washed by the cold sea of Okhotsk, Bering Sea and the Pacific Ocean. The Valley of the Geysers in the eastern part of the peninsula has almost 200 geysers, second in the world to Yellowstone National Park in the United States. Influenced by its latitude and long oceanic coastline, wetlands, stony barrens, lava fields, coastal sands and tundra dominate the landscape. In the north, Japanese Stone Pine and shrub alders run down to the shoreline. Sparse stone birch forests form the typical Kamchatka landscape. 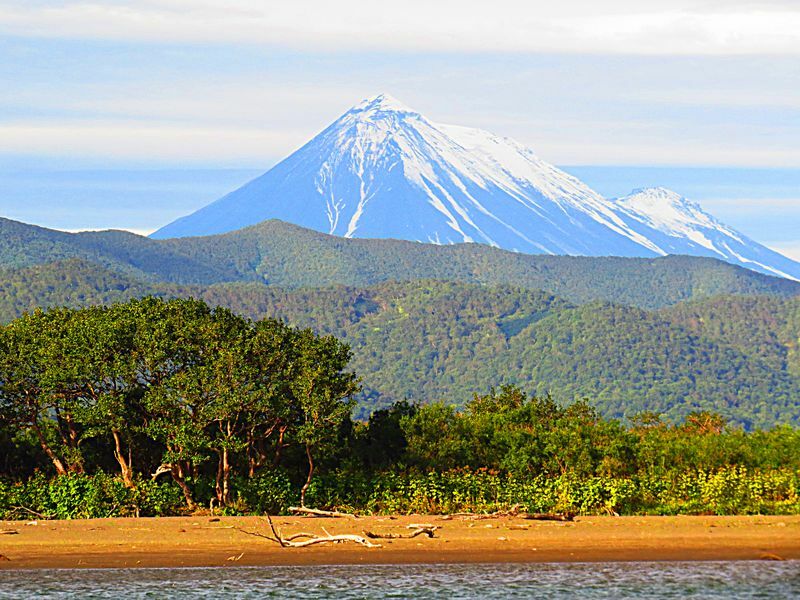 Kamchatka’s most valuable forests lie in the central Kamchatka River valley. Overall, Kamchatka’s natural environment remains one of the most pristine in all of Russia, if not the entire world. Physical Features: Influenced by its latitude and long oceanic coastline, wetlands, stony barrens, lava fields, coastal sands and tundra dominate the landscape. In the north, Japanese stone pine (Pinus pumila) and shrub alders (Alnus fruticosa, A.sinuata) run down to the shore-line. Sparse stone birch (Betula ermani) forests form the typical Kamchatka landscape. Kamchatka’s most valuable forests lie in the central Kamchatka River valley. Kamchatka was first inhabited about 15,000 years ago. These indigenous people’s culture and lifestyle were based on their wide use of the natural resources found there. The Itelmen were mainly fisherman, Koryaks and Evens were hunters and Reindeer herders. The first “Cossack” explorers came to Kamchatka in the early 17th century. At the end of the 17th and the beginning of the 18th century there was a period when interest in the Far East and Kamchatka grew rapidly driven in part by the economic development of Russia by Peter the Great. It was also a period of ruthless and murderous rulers and the native people suffered great hardship. In 1724 Peter the Great commissioned Danish navigator to explore the seas of north-eastern Russia. He led two expeditions to this region. The Capital of the region Petropavlovsk is named after his two ships of his second expedition of 1740. Much of the traditional way of life was destroyed by Soviet collectivisation and the drive for industrialisation. Since the political changes of 1989 and the disappearance of the state-collective systems, the financial support that accompanied these systems has also disappeared and many people are suffering. During and after World War 11, Kamchatka began to develop as a military region. Submarine bases and patrols stretched along its borders. This is one of the reasons why Kamchatka was closed to foreigners and Russians alike. According to latest information, the flora of Kamchatka numbers 89 families, 411 genera and 1170 species and subspecies of vascular plants. The main forest is stone birch. Willows (salix),aromatic polar (Populus snaveolens), aspen (P. Tremula), alders, and other trees grow in floodplains along the rivers. Dahurian larch (Larix gmelini), Ayan spruce (Picea ayanensis), and the Monarch Birch (Betula maximovitschii) grow in the center of the Peninsula. Japanese stone pine and alder shrubs cover mountain ranges and tundra woodlands. 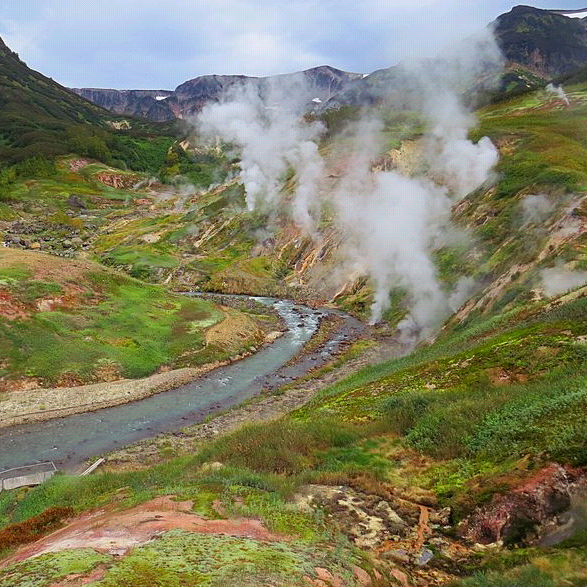 Forty rare and endangered species of plants are found around mineral hot springs and fumaroles, four of these species are endemic to Kamchatka. Forty three mammal species inhabit the region nine of which are marine mammals. 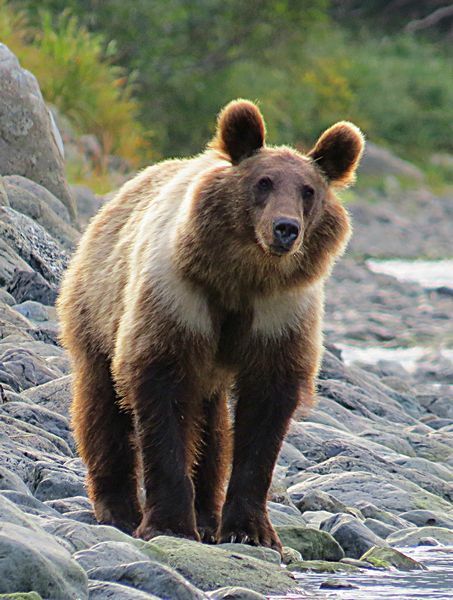 Kamchatka has one of the highest populations of brown bear (Ursus arctos) in the world, it is also one of the largest of the Brown Bear group. Other mammals include sable, which incidentally was hunted extensively – sable skins were extremely valuable, they still fetch high prices today. There are wolverine, wolves and Arctic Fox all of these are still hunted to some extent. The Eurasian Forest Reindeer have been herded for centuries and still are today. Mountain sheep can be found living high in the mountains, they rarely descend lower than 600 metres. Elk or Moose can be found in the forests of Kamchatka and are hunted. Canadian beaver and mink were introduced for commercial reasons and both Lynx and squirrel migrated south into the Peninsula at the beginning of the 1900’s. Marine mammals include Steller Sea Lions, Northern Fur Seals, otters and numerous species of whales including Gray, Minike, Beluga, Bowhead, Blue and Humpback whales. There are a wide range of habitats in Kamchatka and the climate is extreme both these factors have a huge impact on the Birdlife. As Kamchatka is also part of a major “flyway” or migratory route for birds travelling to the Arctic for breeding many of the species recorded there are transients. According to a paper prepared by the Kamchatka Institute of Ecology in 1999 there have been 284 species of birds recoded in Kamchatka. (This includes Commander Islands – see separate article). Because of the extensive coastline and islands within the region shore birds and seabirds are well represented, for example there are 17 species of Gulls and terns recorded. There are 13 species of Alcidea’s listed as breeding including the rare Kiittlitz’s and Marbled Murrelets. Given the extensive areas of wetlands, especially in northern Kamchatka it is not surprising that there are a large number of waterfowl recorded from the region there are at least 13 species breeding and 45 as stragglers or transient. 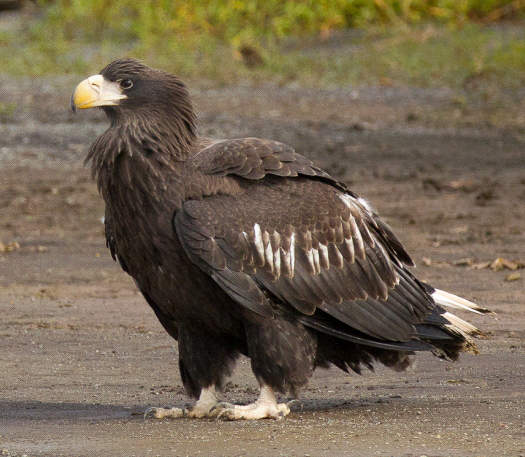 One of the highlights has got to be Steller’s Sea Eagle (Haliaeetus pelagicus) the largest fish eagle and one of the largest eagles in the world. The extremely rare Spoon-billed Sandpiper (Calidris pygmaeus) can be found in the northern part of Kamchatka. Gleadhill, Diana (2007), Kamchatka: A Journal & Guide to Russia's Land of Ice and Fire, Hong Kong: Odyssey Books, ISBN 978-962-217-780-2. Newell, Josh (2004), The Russian Far East: a reference guide for conservation and development, Published by Daniel and Daniel Pub. Inc.